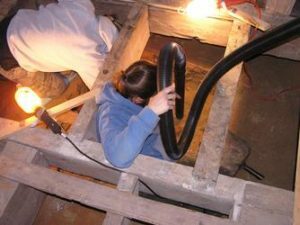 From June 2009 to November 2009, CCR conducted archaeological investigations at the William R. Davie House in Halifax, North Carolina, in support of the State of North Carolina’s proposed historic site development. Davie had the house constructed sometime between 1783 and 1785, and many of his numerous accomplishments were made during his ownership of his Halifax home. Davie was born in England in 1756, but his family removed to South Carolina when he was eight. He graduated from what would become Princeton College in 1776 and then moved to Salisbury, North Carolina to study law. During the Revolution, the young Davie joined the Patriot cause and was serving as an officer in the cavalry when wounded at Stono Ferry, South Carolina in 1779. Following the war, Davie moved to Halifax to practice law. In 1787, he was appointed as North Carolina’s representative to the Constitutional Convention in Philadelphia. Davie became an advocate of the Constitution and remained an ardent federalist for the remainder of his life. Immediately after the state convention in Fayetteville ratified the Constitution, Davie introduced a bill to found a state university. He was to remain heavily involved in the formation of the University of North Carolina and a guiding force during its early years. The archaeological investigations were designed to locate possible outbuildings associated with the original house structure and provide interpretative data for the restoration of the grounds, as well as to investigate the construction of two of the chimneys located on the east exterior façade of the house, and a possible central chimney located under the house foundation. Field methods included systematic shovel testing (72 total) primarily north and east of the standing structure, two “L-shaped” test excavations abutting the two chimneys on the east façade, four 5-ft-x-5-ft test excavations in areas near destroyed outbuildings, and two 2-ft-x-3-ft test excavations (one near a probable filled well and one under the house near a possible central chimney location). The archaeological investigations documented the remains of two structures: a possible smokehouse/ice-house as well as the brick chimney base of a structure to the north of the standing Davie House. Remains of two possible wells were also recorded. 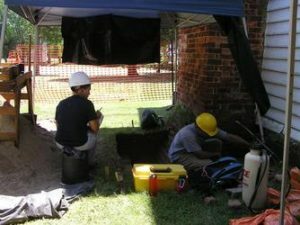 Additional features documented during the archaeological investigation include possible post holes, scaffolding molds, and builder’s trenches associated with the construction of the two brick chimneys on the east façade of the Davie House as well as a possible builder’s trench located on the interior of the house footprint possibly associated with the original construction of the house. Native American artifacts, representing a precontact occupation of the project area, were also recovered from mixed historic deposits. In addition, several post-construction alterations to the landscape were documented including fill associated with a contaminated soil remediation event to the north of the house and another fill event to the east of the house.